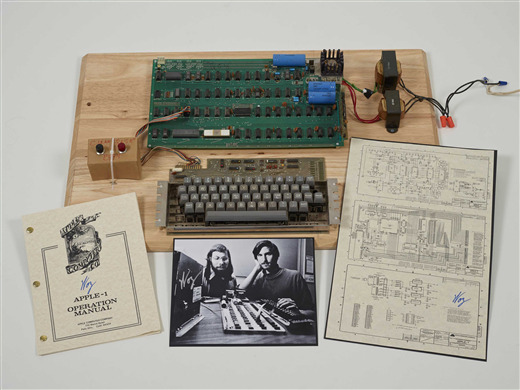 An Apple 1 microcomputer sold at Chistie' on line auction today for $387,000. The price did not reach the high estimate of $500,000 - This is still a big increase from the $666.66 that was the original price in 1976.Less then 50 of these computer are remaining in museum's and private collections. These computers were selling in the range of $20,000 to $50,000 until the past few years. The price at auction started at just over $200,000 several years ago and reaching a high of $641,400 May 25, 2013 at a Breker auction. The Apple 1 has become an Icon symbol of the silicon revolution and museums and deep pocket collectors seem ready to pay the price. The Apple Company has great visibility and is one of the largest stock valued companies in the world. Steve Jobs co-founder ( Steve Jobs passed away October 5, 2011) is considered to have been one of the worlds best at creating new products before customers even knew what they would want. His creative products and his ability to market the them have made Apple the envy of the tech world. The high price for the Apple 1 computer proves some are ready to pay a big price to have a piece of Apple history. Steve Wozniak the other co-founder of the Apple Company gets lots of credit for the price of the Apple 1 computers at these auctions. He designed the Apple 1 and wrote initial software all on his own. The design was really creative and Wozniak realized he had a great computer but it was difficult for the user to add a keyboard & power supply to have a working system. He then designed the Apple 2 as a turnkey plug and play computer. The owners of an Apple 1 were offered the Apple 2 and could use the Apple 1 as part of the payment. The trade in arrangement reduced the number of Apple 1 owners almost overnight. It is not known how many were traded in out of the 200 that were manufactured. Apple 1 computer in the "Bugbook Historical Computer Museum" Floyd Virginia. Thank you for reading my blog - if you like info, news and stories about vintage computers please subscribe or follow by email. - Thank You. This auction continues the high price museums and collectors are willing to pay for the most well know microcomputer in the world.